This statement recently arose from a co-worker in response to my having just updated her on my novel-writing progress whilst we performed a menial task at the office. It’s a common sort of remark, I’m sure, for writers to be told. “What’s the toughest part about writing a novel?” my co-worker went on to ask me. I wasn’t trying to be facetious, but rather to impress upon her that writing isn’t something anyone successfully just does “someday” without at least a little forethought and without being prepared to change one’s normal way of life. We’ve all heard the analogies: writing a novel is like running a marathon; it’s a long haul down a highway of endless distraction and frustration. Non-writers often attribute these hardships to the act of constructing a tale itself – of creating characters; of moving them forward through an ever-intensifying plot; of the hundreds of pages of words and sentences and paragraphs it takes to carry a story from beginning to end. And yet, even if it takes someone half a year just to settle upon his/her characters; even if s/he only has time to write once or twice a week, or less; even if s/he has to rewrite his/her story five and six times to make the plot logical and cooperative and fun, anyone who is committed to put in the work can write a novel in due course. 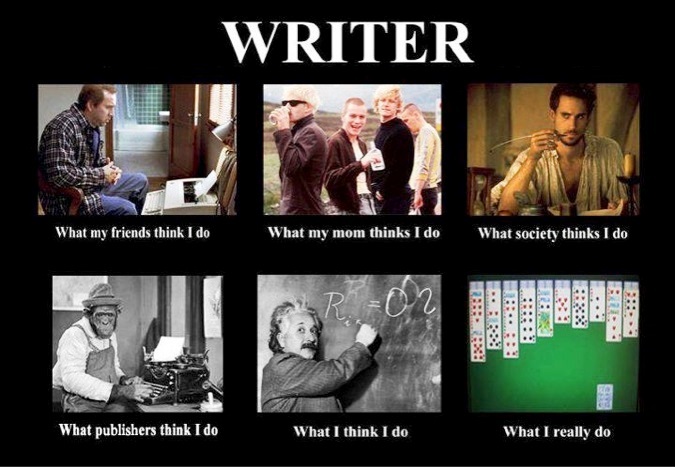 The literal act of writing is hard, but in the grand scheme of things, it’s actually pretty damn easy. We are human, after all; we are wired in our genetic memory to tell stories, of which novels are just a text-based format. What is hard, though, is committing to writing a novel – making the commitment to not only start it, but to finish as well, and then finding the discipline to actually do it. For me, making the commitment to write – to be a writer – was the smallest physical step of my novel-writing journey, yet a necessary catalyst to set the already prolonged process in motion. It’s a step not everyone is willing or able to take. Committing to write a novel means learning to say “No” to a lot of things: going out every night; excessive TV, internet, video games, or any other form of entertainment that subsumes times that could be spent adding new words; being everything to everyone; always being willing to immediately drop everything to offer assistance when other’s ask for it. Your life is no longer your own when you commit becoming a writer: a piece of it is given over to the Muse as surety that you will, indeed, repay your debt of inspiration. Highly extroverted, popular, sociable people like my co-worker often struggle with reordering and reprioritizing their lives to accommodate writing (it is a solitary pursuit, after all), although these difficulties aren’t the sole province of the well-liked. Modern life is busy for everyone: days are short, distractions are ubiquitous, and compared to other artistic endeavours, the interim phases of writing offer little that is truly interesting or necessarily understandable. Plus, life is full of countless other endeavours to pursue that are just as rewarded as writing. And there are only so many hours in a given day. Which is why, to conclude my chat with my co-worker, I offered the reassurance that it’s okay to not be writing your novel now. It’s okay that “someday” isn’t today, or even tomorrow. Just because you’re not quite ready yet doesn’t mean you never will be. If you really want to write as much as you think you do, the desire to do so isn’t going to go away. It will continue to nag you for years, if necessary, until finally – finally – you give in and do something about it. And then your life will never be the same again. This entry was posted in Writing and tagged How to write, Inspiration, Novel writing, Writing, Writing inspiration. Bookmark the permalink. I’ve had a hard time with motivation lately, partly due to distractions that are genuinely unavoidable. I did manage to know about about 4 pages last night, though, which left me feeling more satisfied with my weekend than I would have otherwise. I need remember than feeling the next time i’m not in the mood. I thing that motivation ebbs and flows with all of us, Eric, and that’s okay. Sometimes, we need to push through the lack of inspiration and just make something happen, as you did, and we’ll be glad to have done so after the fact. Other times, though, I think it’s okay to just be kind to ourselves and take a little time. If we’re truly firm in our commitment to write that novel, it will get done in due course. I think the hardest part about writing a novel is *not* writing it. Turning off your laptop and going to bed. Standing in the shower without a pen and paper. Finishing it and sending it publication, knowing you can never touch it again. This is true, Kay – the compulsion to be writing all the time can be hard to overcome. I’ve really had to clamp down hard on myself on this regard – instituting firm rules and practices around the time I allow myself to write – in order to live a more balanced life and prevent writing from totally consuming my thoughts. ‘…in the grand scheme of things, it’s pretty damn easy.’ Janna that’s as perceptive an observation that I’ve read for a long time. You’re right – we build ourselves imaginary barriers and tell ourselves that we’re somehow carrying out some difficult task. Strip those mental blocks out of the way and…anyone can write passably well. We’re all already natural storytellers just by virtue of being human. We just need to find the motivation amongst a world of distractions. And the patience (again amongst a world of distractions) to piece a novel together word by minuscule word. So true…but an even ‘harder’ element to writing a novel might be getting it published once you have rewritten it more times than you want to admit. I submitted a novelette in Feb 2012…the publisher hasn’t said no, in fact we go back and forth every six months or so. They asked if I would also send a short story, so things look positive, but? Ah, yes – there is that. I haven’t submitted anything since I was in my early 20s, so I can’t speak with any experience on that point. Perhaps another blog post in the near(ish) future…? In the meantime, since Feb. 2012 is a very long time for a publisher to still be humming and hawing over your piece. Personally, I would consider withdrawing it from consideration, sending in the short story, and if they didn’t bite that, trying both pieces somewhere else and forgetting about that particular publication. Just my $0.02. Thanks, Dianne. I would never say “I could have written/painted that” because it wouldn’t be true. One person can never create what someone else has created, as our creations are a product of our unique life experiences. People who say things like that are doing so out of jealousy that the other person made the commitment to see that job through. Little do these jealous people seem to realize that the one thing they actually could have done is make the same commitment to their own art. And they still can; it’s never too late to start. LOVE this post-I could not agree with you more! Being only 21 and still in school, I always make excuses for why I “don’t have time” to write what I want, convincing myself that I have too much going on…in reality, if I put just a little less time toward being with friends, going out, and being on the internet so often, I might actually be productive with my writing. Aside from the distractions, I can’t tell you how many times I have sat down and tried to write a story of substance, only to stop myself because I hated what I wrote. I think what it comes down to is having not only the dedication, but the courage to write something and believe it to be worthy.